Flow Control Valves are used to reduce the rate of flow in a section of a pneumatic circuit, resulting in a slower actuator speed. Unlike a Needle Valve, a Flow Control Valve regulates air flow in only one direction, allowing free flow in the opposite direction. Flow rate requirements are extremely important when selecting a pneumatic Flow Control Valve for your application. The speed of the related actuator is dependent upon how quickly the actuator can be filled with air at the input and exhausted at the output. Pneumadyne offers air Flow Control Valves in a range of styles, configurations, and port sizes. If you’re not sure which model is right for your specific application, please don’t hesitate to contact us. 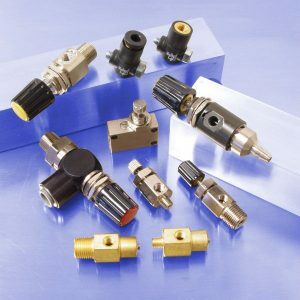 Our knowledgeable team will review the needs of your pneumatic system and help you select the Flow Control Valve that best meets your requirements.